Build your self confidence with the ‘Be More Confident' affirmations session in ‘Theta'. Whether you want to boost your self confidence for a one-off event, or increase your general confidence levels, listening to affirmations can be very effective. Whether you want to boost your inner and outer self-confidence for a one-off situation or event or increase your overall confidence level, listening to positive affirmations can be very effective. 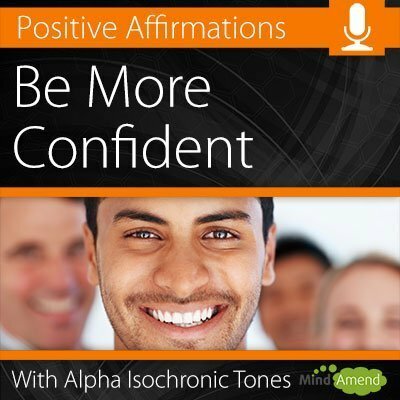 #Short Term Benefit – If you have a situation or event where you could really do with a boost in confidence beforehand, listen to the Be More Confident affirmations just prior to and in the build-up to the event. #Long Term Benefit – Deep inner confidence is something which needs to be built and developed over a period of time. Use the affirmations track daily to help re-enforce your belief in yourself, and help build up your natural confidence over time. The Be More Confident track comes in 7 different versions. The ‘Just Tones' track doesn't have any background music, just the isochronic tones and the affirmations. All the other versions use the exact same isochronic tones session and affirmations, but with an alternative background track for more variety.